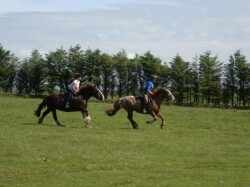 At Hallagenna we can offer the endurance rider an excellent location to train and prepare for future endurance competitions. With the open spaces of Bodmin Moor on your doorstep, you have direct access to some of the best off-road riding in Europe. A varied moorland terrain of rocky tors, woodland tracks and access to traffic-free trails leads you around some of the hidden corners of Cornwall. Hire a guide from £15 per hour and ride at your own pace. Our private livery and on-site self-catering holiday accommodation mean you could not wish for a better place to train for your next endurance competition. For more information please contact us on 01208 851500 or email us here.